If Whatsapp doesn’t save your pictures to your phone, it means you haven’t made your settings for that yet. You can think it is a problem or a bug but it is not. Maybe you have picked wrong way to download the files or disable to media download at all. If you are new on the application and if you don’t know how to make these settings, this guideline is going to help you about that. If you have any questions regarding this problem, you can ask us through commenting this page. Run WhatsApp Messenger on your Android device and tap on Settings. You will see the “Media Auto – Download” section in the menu. Tap on “When using mobile data” first and pick any file you want to save your device automatically. Tap on “When connected on Wifi” and pick file types. Tap on ” When roaming” and pick file types again. 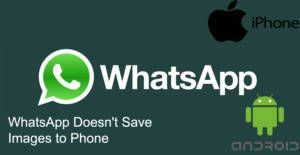 Run WhatsApp Messenger on your iOS device. Tap on Settings icon (Cog) at the bottom right of the screen. Tap on Pictures and select how do you want to download them to your device. Tap on Audio and select the way how you want to download. Tap on Videos and make your selection. Tap on files and make your download selection again. We recommend you to pick whatever kind of internet connection you use very often. If you want to download WhatsApp files manually, we also have a guideline about too on HowtoChatOnline.